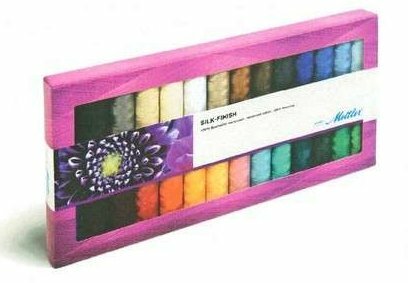 The Mettler SFC28-Kit Silk Finish Thread Set includes one spool each of 28 different colors. Each spool has 164 yards of thread. Colors: 0046, 0111, 0109, 0504, 0450, 0120, 1057, 0020, 1091, 0314, 0757, 0247, 1314, 4000, 1282, 0322, 0265, 3612, 2000, 1222, 0900, 1002, 0825, 1304, 1316, 0350, 0039.